With the magic touch that Frédéric Nicolay always brings to his bars (he has around a dozen in the city), Bar Beton already feels like it has been part of the area forever. It is a curious, perfectly balanced mixture of cool and down to earth, cutting edge and retro and is like the local bar we’d all love to have on the corner. Bar Beton was almost a bookshop, but the chain that Nicolay offered the space to turned the opportunity down, so he decided to open a bar here instead, halfway up a street that is lively at both ends, but somewhat dead in the middle. 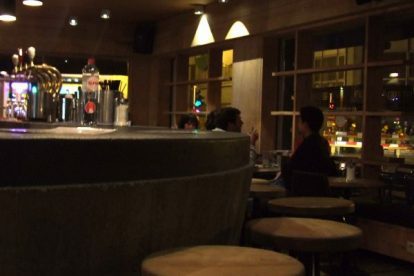 The solid concrete bar, an exact replica of the reception desk at Le Corbusier’s Unité d’habitation in Marseille, dominates the space and gives the bar it its name. The rest of the small space is given over to wood, which makes up the floor, walls and small tables that hover like satellites around the immense central bar. This gives the bar a cozy and warm feeling and makes it perfect for a morning coffee with a newspaper, or an evening beer with friends.